The Stampede, the Saddledome, the 1988 Winter Olympics – Calgary is the home of many events, landmarks, and moments in history. Now, Calgary is also home to one of the largest man-made holes in Canada. Construction of TELUS Sky, a 60-storey development, will be one of the tallest buildings in the city and the excavation for a building of such height required a 31-metre hole be dug beneath its surface. Not exactly business as usual when having to excavate in downtown Calgary. Gryckiewicz says during excavation of the Bow building in Calgary, which is on a larger site taking up two square blocks, they had the space to build the conventional ramp leading down into the excavation. Trucks could then drive down to be loaded with dirt and drive back out removing it from the site. So Gryckiewicz’s team took a different approach by bringing the dirt up to the trucks which were parked on the street. There was talk of installing a conveyer system, but that would not bring out the volume of dirt needed to meet their deadline. Digging down to 102 feet and removing nearly 80,000 cubic metres of dirt would require some innovation. Dirtzilla, a clam bucket attached to a 110-tonne crane and capable of scooping seven-and-a-half yards of dirt at a time, loaded the excavated dirt into the hopper they created which then fed into a series of dump trucks up at street level. The first cut of the excavation was done using conventional track hoes and the trucks were able to drive up and be loaded with dirt. Then, as the dig went deeper, four excavators were in the hole digging and casting the dirt into the corner for Dirtzilla to remove. When nearing the end of the excavation, crews hit some difficult rock at the bottom so they attempted some blasting which, says Gryckiewicz, didn’t make a significant difference so they continued breaking the rock with hydraulic breakers to finish the project. Once the excavation was complete, two cranes were brought in to haul all of the equipment — including some of the shoring — out of the hole and onto trailers. The innovation garnered the company some attention from organizations including the Canadian Society for Civil Engineers and SAIT, and the team received requests to consult on projects in Vancouver and Toronto. 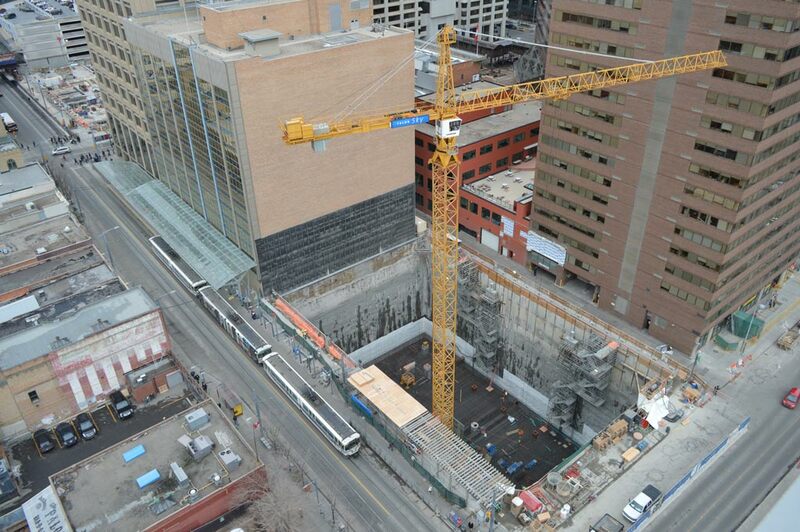 Before any construction could begin, HCM Contractors Inc. spent approximately six months assessing the site before developing a shoring system suitable to extend 30 metres down under Calgary’s downtown. In addition, they worked collaboratively with other sub-contractors, such as Professional Excavators Ltd., to ensure work could be carried out seamlessly in the small area. Chong says in this case there was a layer of soft clay inside the bedrock, which could result in excessive movement. 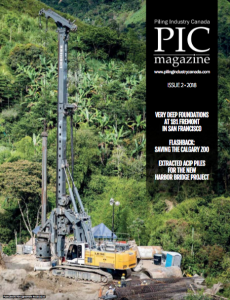 Due to the soft layer of soil in the bedrock, Chong says they increased the length of the caisson piles by approximately a metre to extend well into the bedrock. 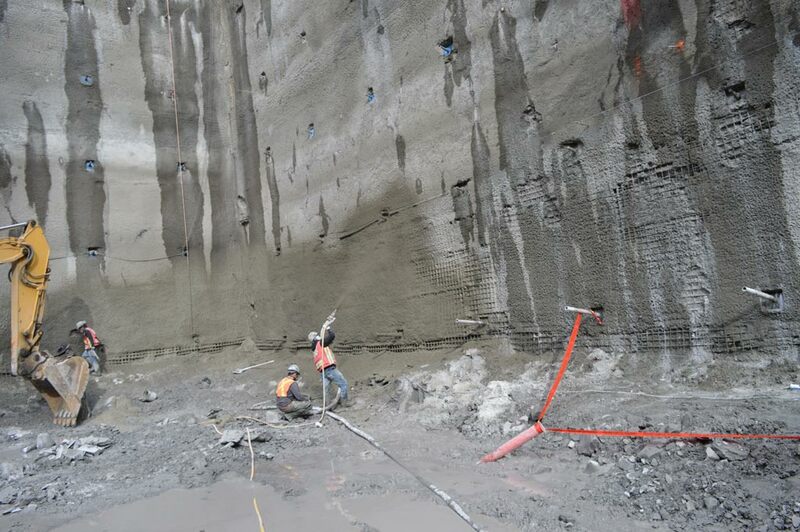 They used caisson wall in the top gravel layer and transitioned into shotcrete in the bedrock to better stabilize the neighbouring structures which were sensitive to ground movement. All trades had to be carefully coordinated while working on the confined site in the city’s centre in order to remain efficient and effective. And, due to that effective coordination and efforts of everyone involved, Westbank Projects Corp. says the project is ahead of schedule. While mixed-use buildings are common in larger cities, there are less of these projects seen in Calgary. Even the idea of having residential accommodations in Calgary’s downtown core is a big shift. But while the design, the innovation, and the philosophy are distinctive, the finished product will be a positive change to the look and feel of the city.